This Coconut Pancake Recipe makes a fluffy pancakes with just the right amount of coconut flavor. Coconut is on the brain, as well as all warm and sunny, blue-watered places that inspire all things coconut. So what better way to start the day than with Coconut Pancakes? Stick your feet in a kiddie pool, turn on some Caribbean tunes while you enjoy a plate of these, and you just may be able to drift off to a deserted island even if for a short while. This recipe creates a thicker pancake batter for fluffy coconut-y pancakes. The addition of coconut milk and shredded coconut creates a thicker batter than regular pancake batter, but you will find that they cook in the same amount of time as most pancakes, rising a little more to their fluffy goodness. I’d recommend testing a few to begin with to perfect the cook time and desired size. Top these Coconut Pancakes off with your favorite syrup, fresh whipped cream, fresh berries or a bit of lime zest for a delicious tropical-inspired start to the day. You may find everyone rising and shining early for these. The early bird gets the Coconut Pancakes after all! Enjoy! And pass the syrup! Yield: Makes about 8 pancakes. This recipe creates a thicker pancake batter for fluffy coconut-y pancakes. Top them off with your favorite syrup, whipped cream, or berries for a delectable start to the day. I may get up even earlier if these are on the menu. The early bird gets the coconut pancakes ya know? Lightly mix all dry ingredients together. Add all wet ingredients to the beaten egg and combine well. Mix the wet ingredients into the dry and stir until incorporated. Don't over mix. In a hot skillet or griddle, add a pat of butter if needed to coat pan. Over medium-hot heat drop rounds of batter and let cook until bubbles begin to pop in center of pancake, about 2 minutes. Flip pancake and cook for an additional minute or so until golden brown. Test cook surface and temperature, and adjust cook time accordingly. Originally posted June 20, 2011. Updated August 11, 2015. I’m really into coconut milk and cream these days, it has such a nice flavor that is so subtle in batter and other treats. I’m definitely going to try these! Mouthwatering! I absolutely LOVE coconut milk. Have you ever had coconut butter?! It is so delicious. It would taste so good smothered on these! These look great! I love coconut in anything! Gorgeous! We are pancake fanatics around here, looking forward to trying your delicious coconut ones! I like ANY kind of pancake!! These look divine. 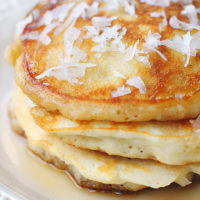 My favorite pancakes are made with ricotta cheese and blueberries but I LOVE coconut and am already thinking about these, with maybe a ginger/coconutty (I use the word; it’s in Webster’s isn’t it?) syrup. Pancakes and Coconut 2 of my favorite things together? Those little beauties make me feel sunny just looking at them. I’ll get the kiddie pool ready when it comes time to eat one and I’m quite certain that I’ll find myself smack dab in the middle of the Caribbean. I like the flavor of coconut but not really coconut itself. These look like they would taste like a tropical island! coconut was always in my top 10 – add these goodies to the list! Amy, these sounds SO good. I am so curious to try coconut milk in my next batch of pancakes. I will definitely try these. I do love buttermilk pancakes. I’m making these for my husband, he’s a serious coconut lover! please don’t judge me but my favorite pancake are from ihop. But, I am pretty sure that these would be my new favorite…as long as you come over and make them for me, kay? I love coconut and I sure eat a lot of pancakes. They sure look like a winner. Ummm sign me up for all of the above 🙂 These will eaten beachside very soon! I would rise early for these pancakes ANY DAY!!! They look incredibly delicious Amy. Well, I know what I’m making for dinner…can’t wait for breakfast. 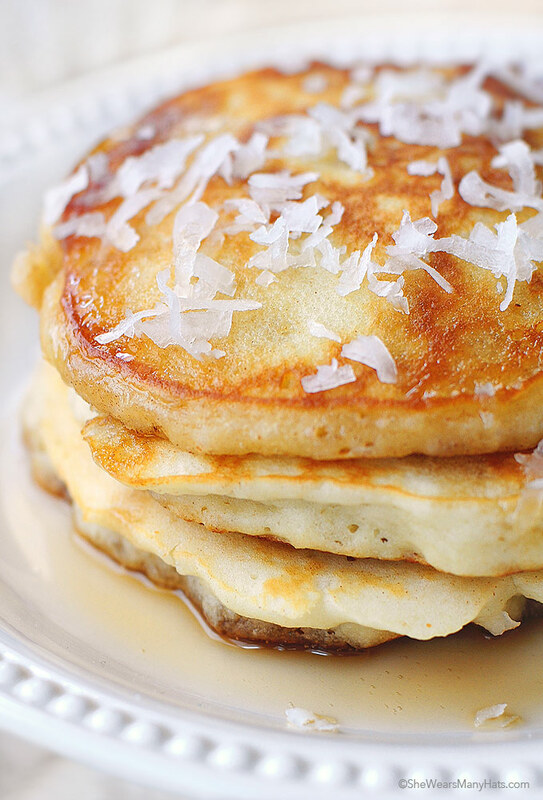 These coconut pancakes look absolutely delish! I love the coconut sprinkled on top, too! Where is my mixer? These look wonderful. I usually love blueberry or apple but never in a million years would I have thought of coconut. Divine! Yum!!! I saw these on TastyKitchen and had to swing by to say that they look MARVELLOUS. I love coconut milk in curries, and I’m excited to expand and use it in other things. Mmmmm. My favorite pancakes are chocolate chip, but they never turn out as fluffy as your did. 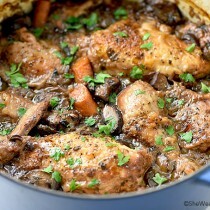 Thank-you for this recipe, oh my goodness I cannot wait to make these they sound so good!! These sound amazing. Coconut and coconut milk? I’m in. Coconut definitely reminds me of my favorite vacation spot – Hawaii. I had a taste of fresh coconut water for the first time straight from the coconut, and bought all sorts of tropical fruit which would go nicely on top of these gorgeous pancakes – papaya, mango, passion fruit, pineapple. That sounds delicious! 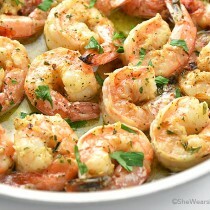 I’m always trying new dishes to keep my girls palate full of life! Thanks so much. You have a wonderful site. That sounds delicious! I’m always looking for new ways to keep my girls palate entertained and coconut is a fav of mine. Thanks for posting!! Wow! These look amazing. Love the ingredients too!! My favorite pankcakes are the whole grain ones (no lies) with fresh bananas. Yum!! There is something about the warm pancake with the warmed banana that touched the skillet, yet still a little cook in the middle. Ahhhh. I was wondering – do you mean coconut milk from the carton of from the can? I started making these a year ago and always used from the can, but I just realized you might’ve meant from the carton? Just made these again this AM! They are so good and not too sweet. These were delicious! I didn’t have buttermilk so I just used 1%, and to add a little more coconut flavor I used coconut oil instead of butter for greasing the pan. I made half the batch as is, and then I added chocolate chips to the other half. Adding the chocolate chips made these the best pancakes ever! 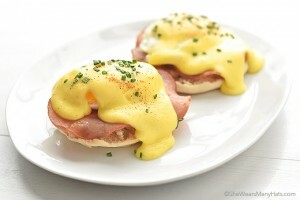 Hi, I would love to try this.It looks scrumptuous.Please suggest me some replacement for egg.. 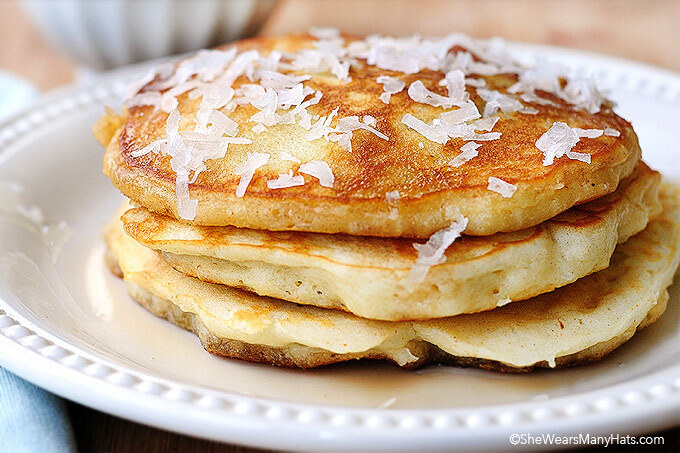 I love coconut and these are going to be my new fav pancakes! This morning I made these pancakes and they cook up nicely and are delicious. I am incapable of making things faithfully to the recipe so I added 2 tbsp wheat germ, 1 cup of whole wheat flour (instead of white), doubled the recipe so used 1 can (about 2 cups) of coconut milk, used flaked coconut instead of shredded and added 1/2 tsp of cardamom. I made a sauce of 1 cup frozen raspberries, 1/4 cup fresh orange juice and 1 tsp honey and simmered this for a few minutes. 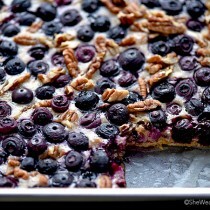 This was tart so you might add more honey. Hello Jean, I’m sorry you’re having trouble, but without being right there with you, I’m not really sure what to tell you. A couple of things … is the griddle well buttered/oiled? Is it hot enough? I wish I could be right there with you to help you figure it out. My goodness – these are tasty. I totally adore coconut so it’s great to get such a coconutty (not a word) recipe. The whole house loved them – thank you. I made these this morning and they tasted great. Loved that the coconut flavor was subtle. Thanks for sharing the recipe! I’m happy to hear that you enjoyed them, Priya! Wow, that sounds awesome! So awesome, I actually added it to an article I wrote titled “Caribbean Destination Inspiration.” Thanks so much, check out my article. I Like this, sounds nice I will make sure I try to make coconut pancake. Me too, Erin. Pancakes for dinner is always a good thing. I DID make these for dinner lol…was just one of those nights a meat and potato meal wasnt appealing. I smeared abit of butter over them, sliced up a banana and then drizzled honey over top. Holy crap were they good! I loved how the bits of coconut in the batter sort of toasted while frying and it added a wonderful taste and texture to them. I will for sure be making these again! Hey Amy, These pancakes really hit the spot! They are a lot better than the standard Waffle House or grill joint fare. These are super tasty! I fried mine in a cast iron skillet with coconut oil. Delish! Can these be done up in a waffle pan. I’m thinking waffles for breakfast. Waffles with my favorite ice cream coconut almond chip for dessert for guests. Do I need to make any changes? I’ve never tried this batter in a waffle pan, but I don’t see why it wouldn’t work. Just watch and adjust temperature and cook time. Let me know how it goes! I was a little disappointed to find out they didn’t have any coconut flour in them. I suppose the texture would be all off then but I would be tempted to sub some coconut flour and a gf all-purpose mix and see what that turns out like. I’d love to hear how they turn out for you, Mary Jo. I’m making these for my son, he’s a serious coconut lover! Yummy, yumm…. It makes me hungry. Thanks a lot for your recipe. I really like pancakes and coconut. this recipe drives me crazyyyyyy. Just made these and the pancakes turned out fluffy and gorgeous with a subtle coconut flavour! Thank you for sharing your substitutions, Dukie! I’m happy to hear that you enjoyed them. Question. For the coconut milk, do you mean the refrigerated kind like almond and cashew milk, or do you mean the coconut milk that comes in a can? Really good light and fluffy pancakes! Easy to make! We have tried a lot of pancake recipes and the kids said this was their favorite! With a subtle coconut flavor and sweetness throughout, these pancakes are tasty as is and don’t really require any additional toppings. The only downside is that they don’t form lasting crispy tops/edges that you’d normally find on traditional buttermilk pancakes (aka they get soggy pretty fast). Although the recipe states that it yields 8 pancakes, I was able to make about 16 (3-4in.) pancakes. Side note: With the addition of more fat, I think this recipe would make some pretty stellar waffles.